Holy cow we are a lucky bunch of folks! We have four beautiful Jersey/Swiss cows that feed exclusively on grass year-round and make nutritious, delicious milk for us to consume. From these four lovely ladies we get much more than our community of 45 can drink. So, we’ve created a dairy workshop which meets four afternoons a week to transform that milk into an array of wonderful value-added products. From yogurt to butter to kefir to cheese, we do just about all of it! The experience is enriching and therapeutic for everybody, the cost-savings on groceries is wonderful, and the products are delicious and healthy! The workshop began three years ago when Sara, Thomas, Jemma and August started making chevre from our goat, Honey’s, milk. The chevre got such a warm reception from the community that soon the dairy workshop expanded to two days a week and included Ann Blanchard as well. Together we made butter, chevre, yogurt, and sour cream. 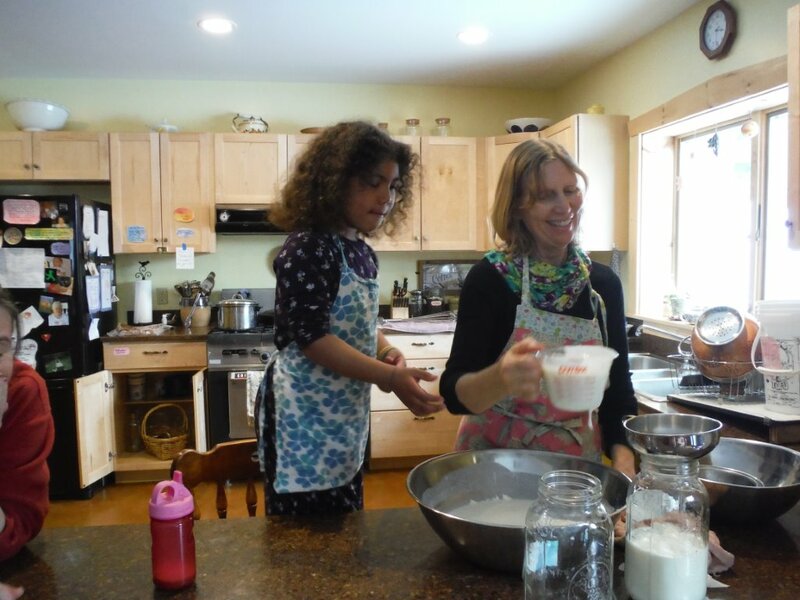 Sara could often be seen lugging five-gallon buckets of milk into White Pine House late at night after the children were settled in attempts to keep up with requests for these yummy products! Sara’s dream throughout the early years was to expand the crew’s knowledge of cheese making. In the past few months new co-worker Dan has brought his experience of cheesemaking from Jasper Hill Farm to the workshop. One day a week the workshop turns about 14 gallons of milk into two Colby-style pressed wheels. 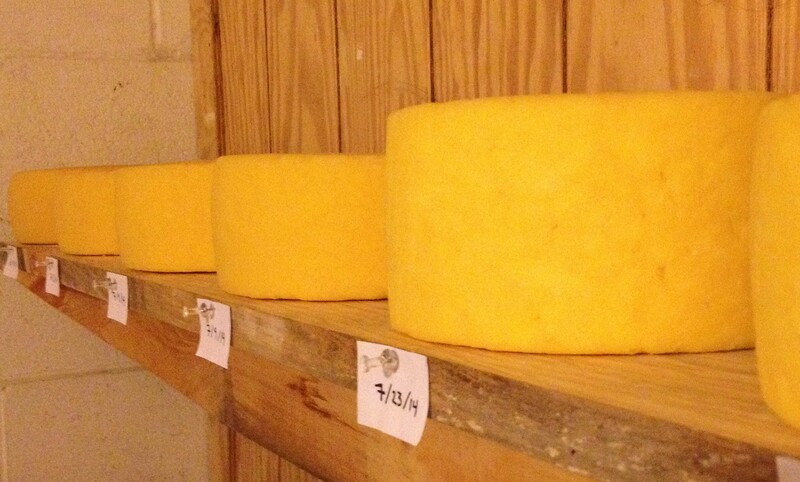 We have even outfitted the root cellar of one of our houses into a little cheese cave corner! We are also excited about the scrumptious butter Connor is churning up for us in our antique ceramic crock. In addition to Connor, we have Annie Jackson the cream-separating queen, Thomas the yogurt master, Brittany the fantastic fromage stirrer, and Kei the kefir king, all lending their helpful hands in the workshop.